Returning overdue books to the library is certainly an act of good conscience, but it’s not usually newsworthy–unless the books were checked out over fifty years ago! A PSU Library patron recently made news by kindly returning two books that had been checked out in 1963. 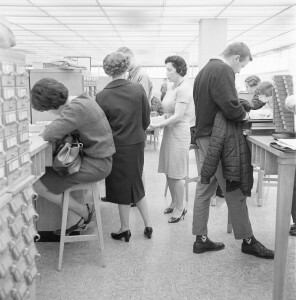 The campus history experts here at Portland State University Archives got to thinking about what using the Portland State library was like in 1963, and how much the library’s building, catalog, contents, and services have changed–and stayed consistent–over the past fifty-two years. In 1963, the core of the Portland State College campus around the Park Blocks was in the early stages of growth. From 1952 until 1957, the college’s first and oldest downtown building, Old Main (now Lincoln Hall) was the PSC campus, and contained the library, the cafeteria, the gymnasium, the science laboratories, the performance and lecture halls, and the classrooms. The Library in Old Main had a capacity of less than 50,000 books and could seat about 175 students! 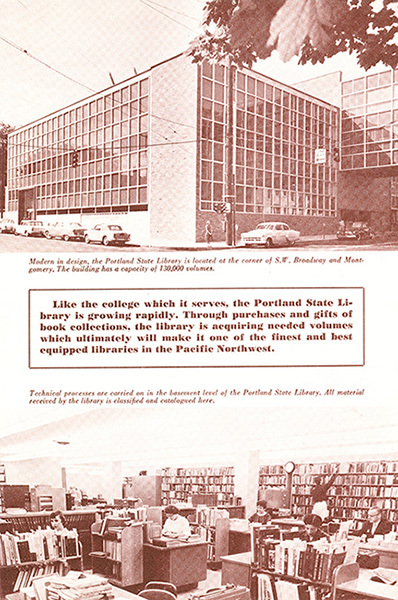 In 1960, PSC opened its new Library on the corner of SW Broadway and Montgomery streets (the northeast corner of today’s Smith Memorial Student Union). A brochure advertising its opening in October 1960 celebrated the new library’s size (130,000-volume capacity), modern design, technology (microfiche, reel-to-reel film and audiotape), and open-stacks design arranged by subject. 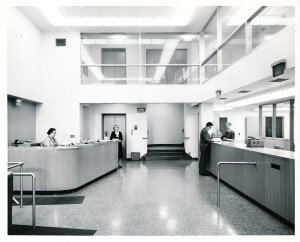 The Library lobby and checkout area opened onto Broadway, and a large study hall also filled the first floor. 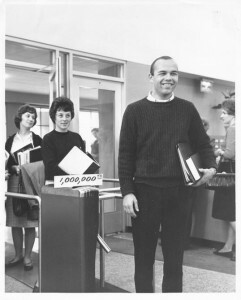 It was a popular place to study and the collection was heavily used; the 1,000,000th patron, student Phil Rothrock, was celebrated in 1962. The entire library catalog of books, periodicals, films, records, tapes, and fiche, was meticulously created and maintained on hand-typed, hand-processed catalog cards. Checkout records were also kept and revised manually on cards stamped with due dates. 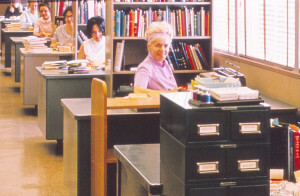 Reference and service desks were located on each of the Library’s floors. 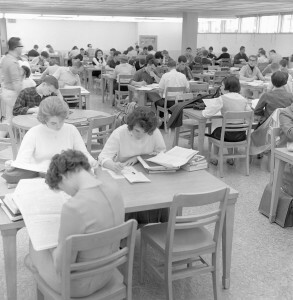 The basement (currently the home of the OIT Help Desk) housed A/V Services and part of the library’s technical processing staff; the second, third, and fourth floors (now the mezzanine levels of SMSU) held the circulating book collections, periodicals, and readers’ guides. 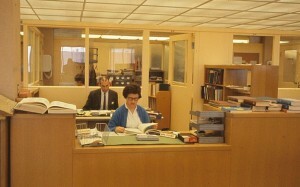 Subject librarians, like Science Librarian Jolene Kuhns (pictured), staffed reference desks on each floor. 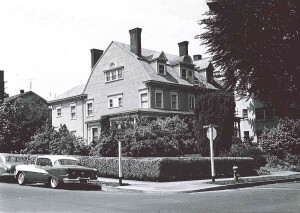 Throughout the early and mid-1960s, Portland State College continued to expand. The Smith Memorial Student Union (then known as the College Center, which occupied the Park Avenue side of the building shared with the Library) received a half-block addition. Science I and the Peter Stott Center were built to meet desperate needs for laboratory and gymnasium facilities long outgrown in Old Main. A new freeway, the I-405, was constructed, bringing more students to Portland State College’s commuter campus. And the Library soon outgrew its early sixties location on Broadway. 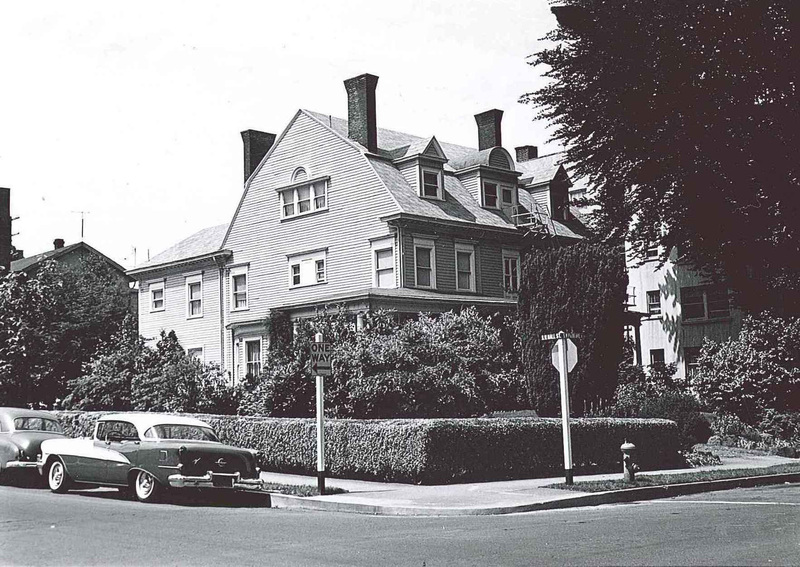 In 1967, ground was broken at the Library’s current location on Park Avenue, which in 1965 was still a partially residential street. The tree in the upper right corner is the copper beech which stands in front of the library today. All of this is just a brief snapshot of how the Library building, collections, services, and technology have changed since those recently-returned books were checked out in 1963. For more historic images of the Portland State campus, faculty, activities, and athletics, please visit Portland State University Archives’ Digital Gallery–and thank you for always returning the materials you borrow!